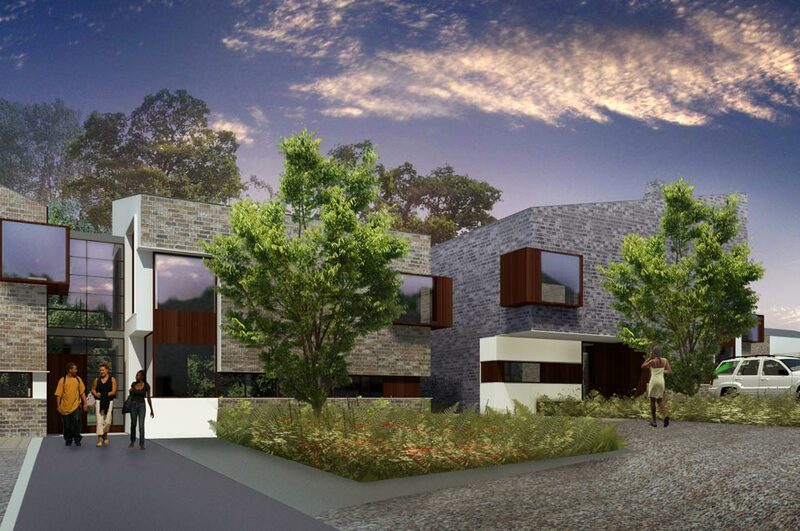 This family friendly two storey residential development comprises five terrace 3-bed mews houses, two terrace 2-bed mews houses, 11 detached 5-bed houses, and one semi-detached 5-bed house. 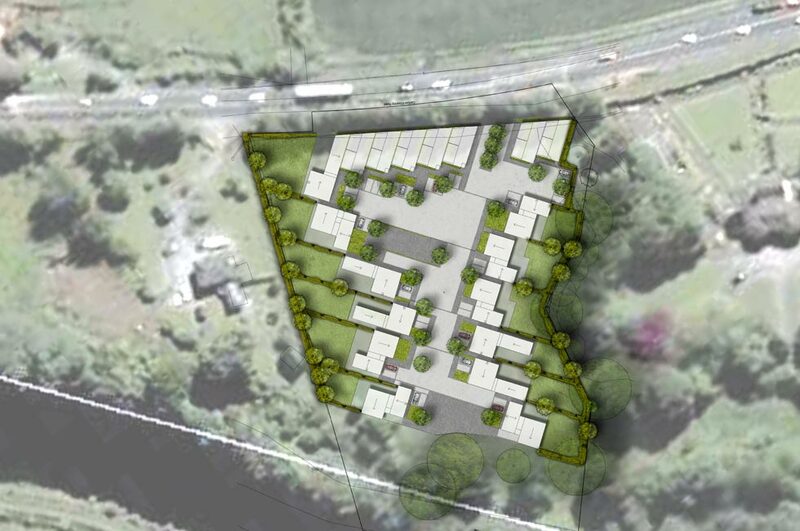 The development is located on agricultural land within the ‘romantic’ landscape of Erindale Demesne and is bounded by Erindale House a protected structure, the Kilkenny Road and the River Barrow. As a residential development the key design principle was the establishment of a community atmosphere. 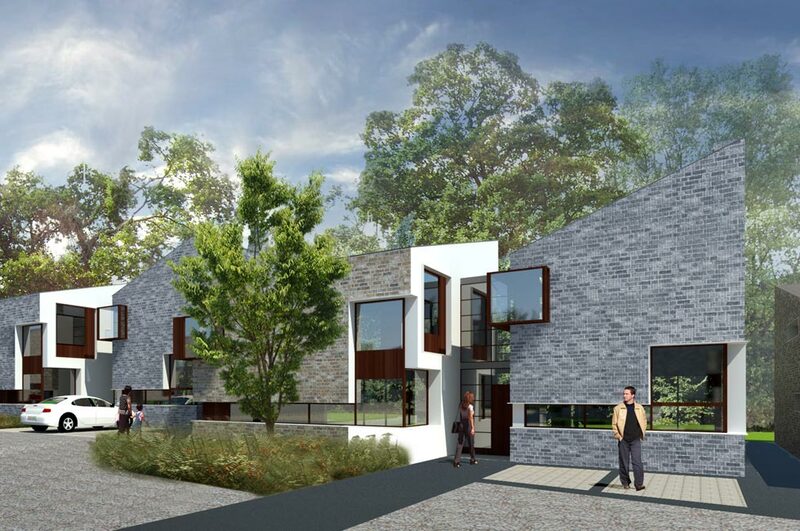 The houses are laid out to form a ‘home zone’ comprising two interconnected cul de sac’s, with contextual variations to the form, location and façade of each unit. Each house is bound by a private garden of aprox 100-200sqm, with the mews houses also featuring a ground patio and a upper first floor terrace with views over the river landscape. The design aims to achieve housing with the highest BER rating. Roofs generally face south or west to take advantage of solar gains and are integrated with solar panels. Houses are fitted with grey water harvesting systems to reduce there water intake and discharge. Houses are designed on a east west axis with dual aspect living spaces to provide the maximum amount of light to rooms. The materiality of the houses types has developed from the established characteristics of Erindale House. The fragmentation of the street edge established a series of playful anti spaces. The design removes level changes across the road surface making the street completely open for play and universally accessible. The consistent use of materials throughout the site provides a clear framework for crossing points and car parking, and defines the areas to the front of the residences. 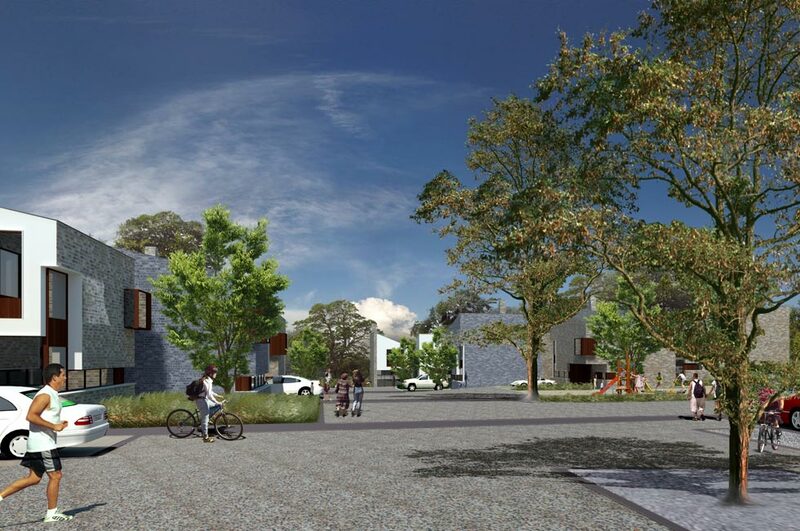 The houses are designed to allow through views from the ‘home zone’, enhancing passive surveillance, encouraging a safe child area with social integration and a close neighbourhood environment. In response to the sensitive setting along a river edge a horizontal flow wetland system was developed to avoid discharging surface water from the site. Drainage channels will direct surface water from the hardscape to planted drainage beds, underground drains,and subsequently to the attenuation tanks. The scheme utilises the existing topography and vegetation, both riparian and ‘romantic’, to integrate the site into the demesne landscape. This is revealed through the assimilation of the modified contours with the existing landform, the subtle use of materials on the ground surface and the creation of a continuous tree canopy. A horizontal flow wetland system is integrated into the design to avoid discharging surface water from the site and to enhance the existing river meadow. All of the elements are ordered through the use of a grid that leads to an interlocking pattern of hard and soft materials, and creates clear linkages to the river. This pattern knits together the enduring components of the demesne landscape and the design intentions. Client: Sporting Concepts Ireland Ltd.